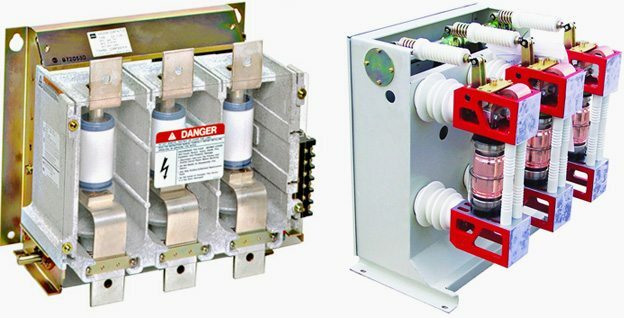 To compare the application of medium-voltage circuit breakers and of fused contactors, we must understand the basic characteristics of each switching technology. Comparison presented here shows the major characteristics of medium-voltage circuit breakers and medium-voltage fused contactors that influence the application. Of course, the table entries are generalized, and the information varies by the voltage and current ratings of the equipment. However, the comparison is valid for an overall understanding. Typical loads include transformers, capacitors, larger motors, generators or distribution feeders. Process continuity is critical (e.g., no time for fuse replacement). Reduced-voltage (RV) starting is not needed (RV starting complicates switchgear bus arrangements). Typical loads include motors or smaller transformers. Continuous load current is low or moderate (e.g., smaller motors or transformer. Switching is very frequent (e.g., daily or several times per day); very high endurance (100,000s of operations) is needed. Process continuity is compatible with fuse replacement time. Reduced-voltage starting is needed to reduce starting duty (and voltage fluctuation) on system. Historically, circuit breakers have been used for medium-voltage motors in certain industries, especially in utility generating stations. As these stations have aged, and station operation has changed from base-load to peaking service, many of these motor-starting circuit breakers have experienced total operations well in excess of the endurance required by the ANSI/IEEE standards. As a result, these applications have had higher maintenance costs than if medium-voltage fused contactors had been used originally. In contrast, users in the process industries have long favored the use of fused Contactors for such applications, and have enjoyed long service with lower maintenance costs. Hola. mi duda es : si un cartucho de vacio se perfora, este pierde aislacion y la distancie entre los contactos es muy reducida.. que sucede con la seguridad de quienes trabajamos sobre la salida del equipo ? Hi. My question is: if a vacuum cartridge is perforated, it loses isolation and the distance between the contacts is very small .. what happens to the safety of those who work on the output of the equipment? we need offer about circuit breaker if your company have the mention part please send your quotation.